Eunice (Boots) Worthington Brandt Jones, born June 9, 1930 in Birmingham, Alabama, died Saturday, June 9, 2018 at home on her 88th birthday. She was the daughter of Adolph Sternberg Brandt and Eunice Cecile Worthington Brandt. 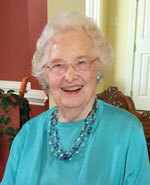 She was preceded in death by her husband, James Addison Jones III (Jimmy), and survived by her two children, James "Jim" Addison Jones IV (Suzanne) and Melissa Jones Woolf; four grandchildren, James Addison Jones V, Whitney Worthington Jones Allen (Michael), Charlotte Bea Woolf, and Brandt Allen Woolf; and one great-grandchild, Margaret Cecilia Virginia Allen. Boots grew up in Panama City, Florida, where she attended Cove Grammar School, Wallace Memorial Presbyterian Church, and graduated from Bay County High School with honors. Even as a child, she was deeply involved in community service such as the war effort during World War II: writing a radio program with peers, running a Girl's Victory Club, and the Red Cross. She attended Florida State College for Women, now Florida State University, where she was a member of Alpha Delta Pi sorority. She met her husband and lifelong sweetheart Jimmy when they were 13 in Panama City, Florida. They enjoyed sailing dates and social gatherings on the St. Andrews Bay. After their wedding on August 18, 1951 in Panama City, Boots and Jimmy moved to Salina, Kansas, where Jimmy was assigned to the U. S. Air Force during the Korean War. After the war, they moved with their son Jim to Charlotte, N.C., where Jimmy graduated from Davidson College and they expanded their family with daughter, Melissa. In 1962 the family moved to Coral Gables, Miami-Dade, Florida, where Boots and Jimmy owned and managed the Belle Isle Court Apartments and Galen Beach Hotel. While in Miami, Boots enjoyed fun and charitable work at the Riviera Country Club, The Miami Museum of Science Guild, Coral Gables First United Methodist Church, and Palmer Trinity School, among others. Boots loved traveling abroad with cherished friends and family. In 1982, Boots and Jimmy moved to Natural Bridge, where they owned and operated Liberty Hill Farm. Boots quickly made friends in her Circle at Lexington Presbyterian Church, Natural Bridge Garden Club, Stonewall Jackson House (where she was docent and volunteer), APVA, Poplar Forest, Lime Kiln, Natural Bridge Ruritan Club, VMFA, W&L Alumni College, and many other activities. When asked what was her proudest community achievement, she highlighted the Historic Lexington Cooks cookbook, which was published to benefit the Stonewall Jackson House when she was chairman of the Cookbook Executive Committee. This cookbook sold over 11,000 copies, went into a second printing and was a success documenting regional culinary traditions. Her family will forever remember her selfless compassion, immaculate appearance, insatiable love of reading, scholarly knowledge of history, delight in gardening, and her ability to recall the incredible stories of her life. Her family would like to thank special friends Dr. Robert P. Irons Jr. and his wife, Nancy for their constant support and loving friendship over the years. A memorial service will be conducted at Lexington Presbyterian Church on Wednesday, June 13, at 11 a.m., followed by a reception. In lieu of flowers, memorial contributions may be sent to the Rockbridge Area Hospice. Arrangements are by Harrison Funeral Home.